We left New York three weeks ago, and in many ways it seems longer than that. I feel so at home, that it’s almost like I never left. We kicked off our European adventure by swimming in hot springs in Iceland, and are getting settled in our hotel room living here in Sweden, while waiting to move in to our new home in April (yes – one more month of hotel living!). I’m getting back into blogging, and also hoping that once our life gets more settled, I can also update Skimbaco Home, Skimbaco Travel and Skimbaco Food more regularly. Since I don’t even have a kitchen at the moment, the food blogging will still have to wait, but I have been posting at my home decorating blog and now am retrieving the travel blog as well. When I was planning our move from New York to Sweden, I wanted to make even the flight from the US to Sweden special. I was looking for the best flight prices, and looking at the Icelandair flights when I saw they offer free stopover in Reykjavik. Ever since I flew with Icelandair the first time I had wanted to visit Iceland! 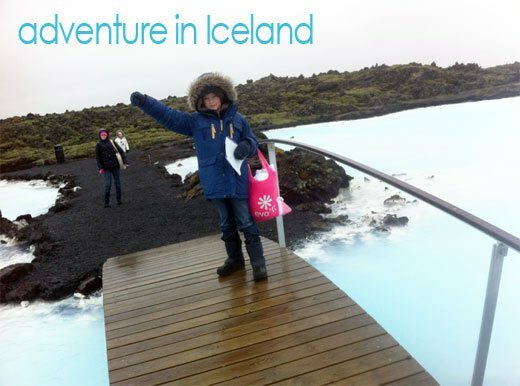 And kids had been studying about the nature in Iceland (hot springs, lava fields, geysers) and I had a real light bulb moment when I decided to take kids to experience Iceland and to swim in the amazing hot springs at Blue Lagoon. I know it was completely crazy to even think about having a stopover – after all, we had a HUGE amount of luggage, and yes, we had to haul that to our hotel in Iceland. But we needed it, I needed it. We needed a moment just for four of us, to pat ourselves in the back for move well done, and to transition from our life in New York to the European lifestyle. And that’s if nothing my friends is living life to the fullest. It was crazy, exhausting, and not easy, but amazing once in a lifetime opportunity and we made it happen. I am so proud of myself that we did our stop in Iceland, because kids and I will remember it forever. If you would like to read the details of our visit to the world famous Blue Lagoon, hop over to Skimbaco Travel to read about our 24-hour visit to Iceland. The last time we traveled to Europe we flew Icelandair and did the same 24-hour stop-over just so we could make a trip to the Blue Lagoon. Isn’t it great? I tell people it’s like sitting in a hot tub on the moon. Thanks Lala!! Yes… it wasn’t easy.. but that’s what made it even more special and we felt that we can concur anything together. This move has done so good for our family already.. Sounds amazing! and what a great experience for your children. They will look back on this and have the most cherished memories. So glad you all are there safe and adjusting well.